Post sets a ball screen for wing. The wing (1 in the diagram) had a ball from the outset of the play. On the ball screen, the wing pulls back with the dribble to be in position to make a pocket pass between defenders. Once the pass is made the wing (1) simulates a flair screen movement to the strong side corner. Coach is going to make a pass to that player for a three. The post immediately sends the pass that came after the roll to the opposite corner (the 3 here) – simulating a collapsing defense. 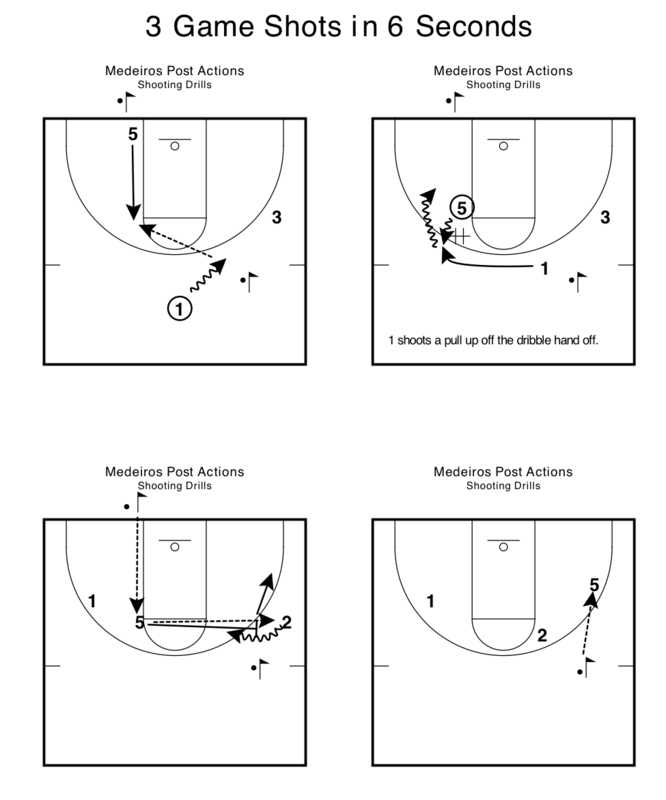 The post will make a flash cut to the high post and get a pass from the other coach. 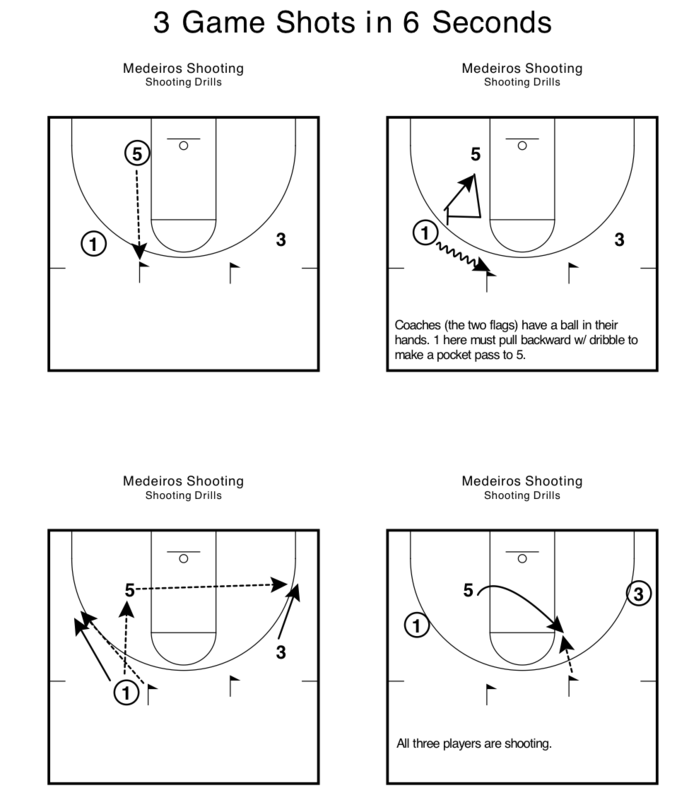 There are two passes made out of the post, one ball screen set, one interior pocket pass made, cutting to open space on the weak side, a flair screen action, and three game shots. All in the span of about six seconds. Copying this exact drill might be an option if all of these actions are common in your offense. These actions also might not fit your offense perfectly, but you can probably design something that does to work on game shots. As Erik Johnson likes, to say it’s not the drill it is what you emphasize. Here is another drill that accomplishes the same end result of the last one: three game shots in six seconds. Guard dribbles away from flashing 5 and then makes entry into high post. By dribbling away the guard makes it easier to make a misdirection cut and get space. The guard takes either a direct hand-off or dribble hand-off from the five for a pull-up. The 5 gets a pass from the coach standing out of bounds. On the catch, the five throws a pass opposite to 3. 5 follows the pass and sets a ball screen for 3. 3 can either shoot a pull-up 3 pointer or 2. The 5 will then pop toward the baseline and the coach on the high side of the floor will make a pass for a shot. When you maximize game shots in practice, it is easy to point to the film of games and justify to players why these kinds of drills are used. If you are just shooting for the sake of shooting, it is not as effective.